If you have been looking for ways to increase your gains from the training sessions, you should also have a good knowledge of how to pick up your training gear. Many people fail to add the optimal gears to their collection of accessories which is why the results take a considerably longer period of time to show up. The same is true for power racks. These are a must if you have been into weight training. Choosing the right power rack can help you build extreme power and strength in the muscles. However, each one differs from the other on a number of aspects and demand different treatments. To make sure that you are not buying a useless rack, go through the following section. This guide will help you land upon the best power rack for the money. There is no standard size for power racks, and they come in all the different sizes. The size should be chosen depending on your height. If you have a tall height, go for a taller rack, if you are short, go for shorter racks and if it is going to be used by multiple people as in gyms, get one those with average height. Before you go out and purchase a power rack, you should be very clear about where you are going to place it. Take measurements of the space in which it is to be installed and determine beforehand whether it is going to fit in the given space. Remember that it is always better to have some open space around the rack so that you can use the rack easily. If the space turns out to be too cramped, you will not be able to exercise properly. Stabilizers are bars that can be installed into the bottom of the rack on the backside. This helps the rack to maintain its balance. However, it also causes some difficulty during training by blocking your way. Exercising without a stabilizer is much easier, but this also makes the rack more vulnerable to falling. Therefore, it is best to get hold of a rack that comes with a removable stabilizer so that you can install and remove them as and per your will. Adjusting a rack can create quite some hassle, especially since they need to be all safe and secure for taking in the heavyweights. Beginners who are not familiar with this may find the process daunting. Due to this reason alone, many people choose spotter arms that are to be adjusted through the straps. These are much easier to use and also greatly reliable in terms of safety. A power rack needs many accessories and equipment for a proper functioning. Therefore, when you are looking for the best value power rack, care to check if it has all the required accessories and if not, whether they can be bought from any reliable brand. Last but not the least comes durability. Stay away from a cheap power cage since it can give away anytime leading to major injuries. Check out the built quality and materials used in the power rack to determine its strength and durability. More than often, even price can be a determining factor for quality and durability. Given below are short and informative reviews of the best power racks of 2017-2018. The reviews highlight important features of each product, thereby helping you determine what is the best power rack for the money. The products included in the review have been handpicked with care and posses all the vital features wanted of a power rack. This is a power rack under 7 feet and has a maximum weight capacity of 1500 lbs. It comes with two different adjustable height positions and two safety bars measuring 11.5 inches and two dual mounted safety bars measuring 35.5”. The combined weight capacity is 1500 lbs. The power rack comes together with low row cable attachment and Olympic lat pull down. With high-quality steel and a sturdy frame construct, they are highly reliable and perfect for strengthening the shoulder, arms, and upper back. This is a highly affordable power rack with a dimension of 83” by 48” by 48”. 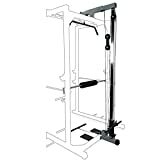 It has a weight capacity of 700 lbs on the bar hooks, pull up bar and dip attachment while 1000 lbs on the bench. With a 44 inch width and 26-inch depth, it offers plenty of room to workout with ease. 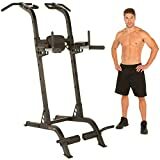 This is the best cheap power rack that comes with all the required accessories such as dual pull up bars, grips, dip attachment and flat bench. This is another one that falls under the best power rack for budget. This is a power rack under 500 dollars with high strength steel bars and HD steel J hooks with a weight capacity of 1000 lbs. There are pull up bars of varying sizes. It occupies a floor space of only 12.11 square feet and has an inside depth of 24 inches. With a total weight of 230 lbs, it offers quite a good stability while also being very easy to install. This is naturally an ideal choice for people looking for the best power rack on a budget. With a price tag of only $287.98, it is one of the best in the category of power rack under 300 dollars. The power rack has a 2 by 2 steel mainframe with a 14 gauge. It can be adjusted to 23 different positions, each with a spread of 3 inches and has two adjustable lift off. With full-length safety bars, the power rack is completely safe to use. It has a maximum weight capacity of 500 lbs. It also has a very good finishing, complete with durable powder coat paint and does not require frequent touch-ups. 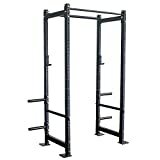 This power rack is made from premium quality imported materials and has a main frame of 2 by 2 inches. The steel plate carriage has 1” by 8” plate pegs and has the foot plate plated with black diamonds. 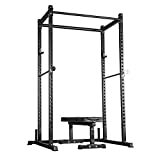 The power rack includes 20” pull down bar and standard black 38” lat bar as accessories. It has a travel distance of 60”. So with all the features combined, it is one of the best power rack under 80 inches. It comes at a price of $168.84, thereby being one of the best power rack under 200 dollars. Having a good idea about the features and working of a power rack may help you come across the best budget power rack. However, owning a highly functional power rack is not sufficient if you have no idea about how to use it in the most effective manner. Given below are some tips that may help you get the best out of your power rack. Power racks can be adjusted in a number of different ways depending upon the preference of the user. To get the maximum returns, you should know which the best setting for you is and use it to your advantage. Nothing can be as inconvenient as exercising with an unstable power rack. Along with inconvenience, it also goes and adds to the risk of injuries. Therefore, make sure that your power rack is highly stable before you go for your regular exercise. Have the bars adjusted in a manner that allows you to fail just below the lowest point. Because it allows you to train without a spotter. Also, you can do a lot of crucial exercises without having to worry about your safety. What exercises can you do on a power rack? A power rack can be versatile when it comes to the number of exercises you can perform. You can do squats, overhead presses, bench presses, barbell curls, rack pull, inverted rows, barbell shrug, upright rows and much more. Mounting depth is the dimension from the front to the back of the rack angle. Cage nuts are square nuts wrapped in a spring metal cage. These are long L shaped brackets installed into the rack for supporting the edges. With this information and reviews, you should be able to pick up the best power rack for budget. If you are able to make the right selection, a power rack can be a high return investment. It can last you for years and allow you to carry out multiple high strength exercises in a very safe and efficient manner.